Welcome John Facemire to our team! John grew up in a small town in the hills of West Virginia. At the age of 17 he enlisted in the military and traveled the world for the next 32 years serving his country. In December of 2014 he moved to Cheyenne as his last military assignment and immediately fell for the community and the small town feel. When he retired as a Chief Master Seargant last year, he and his family decided to make Cheyenne their home. They enjoy their time in Wyoming and love to get out and explore all this state has to offer. As John transitioned from the military, he still desired to be involved with the community and F. E. Warren AFB. He believes the opportunity to work in real estate will allow him the chance to help people with their transitions. John is teaming up with his wife Tammy Facemire who has been an agent with RE/MAX for a year. 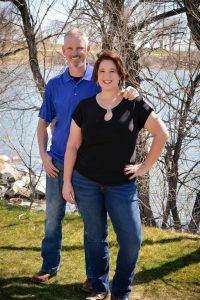 Together they plan to serve Cheyenne’s community and home buyers and sellers with the same commitment, dedication and integrity they have always applied to everything they do. When I asked John why real estate, he said! I’ve always been a people helper. That’s what I do. Real estate is the next step for me to continue my service. We are thrilled to welcome John to our team of top real estate agents! Whether you are buying a new home or selling a property, John and Tammy will work tirelessly to ensure your expectations are met. Call John today at 307-631-1121 or visit them online to get started!